Lamkin’s 2012 collection now features an expanded line of golf grips exclusively designed for women. Lamkin, which already offers the widest assortment of grip sizes in the industry, has gone beyond sizing to include profiles and materials engineered to suit a woman’s swing and grasp. With hues including neon pink and neon purple, and prices starting as low as $4.49, Lamkin's grips also make great alternative Mother's Day gift - and are colorful enough to give as a bouquet! Lamkin Grips' 2012 collection features an expanded line of golf grips designed exclusively for women. For more information, visit www.LamkinGrips.com. One common goal among all golfers is to improve their game, so it’s only fitting that we deliver technology to make that possible for all players, regardless of gender. The difference between men’s and women’s equipment needs on the golf course is as different as … men and women. Such is the case all the way up to the golf grip, which is why Lamkin’s 2012 collection now features an expanded line of grips exclusively designed for women. Lamkin, which already offers the widest assortment of grip sizes in the industry, has gone beyond sizing to include profiles and materials engineered to suit a woman’s swing and grasp. Among the company’s latest releases are the new Undersize R.E.L. 3GEN ladies’ grips. Constructed with a modified version of Lamkin’s proprietary synthetic rubber compound, these grips offer a softer feel than the Standard, Midsize and Oversize models, while still delivering superior tackiness, shock absorption and shot feedback. Just in time for Mother's Day, these grips are available in a wide range of bold colors and affordable prices, making them a fun and functional alternative to traditional Mother's Day gifts. 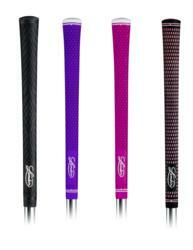 The new R.E.L 3GEN Ladies’ grips (MSRP: $6.49) are available in on-trend neon pink and neon purple colors. An Undersize all-black model with the traditional and firmer 3GEN material also is available. Crossline – Lamkin’s most popular grip for more than 15 years – now boasts an Undersize Ladies’ model in pink trim and traditional black with white trim. Like its Standard, Midsize and Oversize counterparts, the ladies’ Crossline (MSRP: $4.99) features a distinctive, densely spaced pattern that provides superior lateral traction. The company’s budget-friendly X10 grip collection also accommodates smaller grip sizes, with an Undersize model made of a durable, proprietary synthetic rubber material designed to last round after round. Available for just $4.49 per grip, Lamkin’s Undersize X10 enables golfers to affordably update their playing experience as frequently as they wish. For more information about Lamkin Grips, visit http://www.LamkinGrips.com. Lamkin Grips’ golf heritage dates back to 1925 when founder Elver B. Lamkin began manufacturing the first leather-wrap style golf grips. Today, the family-owned business delivers the industry’s best assortment of game-enhancing grips that continue to earn loyal global customers including premium club manufacturers and golfers of every ability. With more sizes, styles, patterns and materials than anyone else in the industry, Lamkin Golf grips provide custom-fit performance benefits to every golfer regardless of age, gender, handicap or rounds played. Last year, Lamkin dominated Golf Digest’s Hot List – one of the industry’s premier golf grips review resources – by securing half of the list’s coveted gold medals.